Absolutely THE Best Vegetable Music Video EVER! You thought you knew vegetable songs. We all thought we knew vegetable songs. But believe me, AKB48’s new release, 野菜シスターズ – Yasai Sisutaazu: Vegetable Sisters – re-creates the genre! If studying Japanese gives one one thing, it is a fresh (no pun intended) appreciation of vegetables. Whether in Precure or Tonari no Totoro, a visit to a vegetable garden is a thing of delight, accompanied by cries of oishii! Western people take vegetables for granted as they take everything else for granted. I have always been filled with wonder at the sheer abundance and kindness of Our Mother’s world, and so are Japanese people. In so many ways, the Japanese attitude seems to me the natural one and the Western attitude peculiar and perverse. Okra-chan: Goodbye dear vegetable friends. Sayounara, turnip-san. Sayounara, carrot-san. All of you, all of you, kindly grew up to be big. It is sad, but the time of farewell has come. Receive the favor of being eaten with appreciation [or, of being eaten and found delicious]. I will never forget you all. As you see, the translation is very awkward and strange, and not only owing to my poor skills in the matter (though they don’t help). I could have made it sound more naturally English, but only at the expense of what is really being said. This is why English subtitles are so inadequate much of the time. They really cannot convey what is actually said and still sound natural in English, so they tend to say something else that is in the same general area but pervaded with much more cynical and less innocent, straightforward, and fundamentally good cultural assumptions. Modern English does not do innocent well. Nor are the ideas of such things as giving and receiving, mutual kindness and dependence, so deeply embedded in the language. When I discussed this recurring scene with a Japanese friend, she said that Okura-chan cried because the vegetables were her 大切な友だち (taisetsu na tomodachi) — her precious friends. So – with a quick run-down of Japanese vegetable culture to prime you, here is 野菜シスターズ – Yasai Sisutaazu: Vegetable Sisters – the best vegetable music-kinnie you’ll ever see! Now with helpful Japanese subtitles for those learning the language*. *A friend told me that the subtitles are in English, not Japanese, which puzzled me. I now realize that the subtitles default to your YouTube language settings. Since mine are Japanese, I see Japanese subtitles. To change them, go to YouTube and click the CC button that will appear at the bottom of this video. You can then choose the subtitle language. Having discussed Okura-chan’s vegetable speech another thing occurred to me that I thought might interest you. In the episode 赤ちゃんマンとオクラちゃん (Akachanman and Okurachan) Okura-chan and a bear are in the position of giving and receiving, each with both hands on the tray of vegetables (as in the picture above). 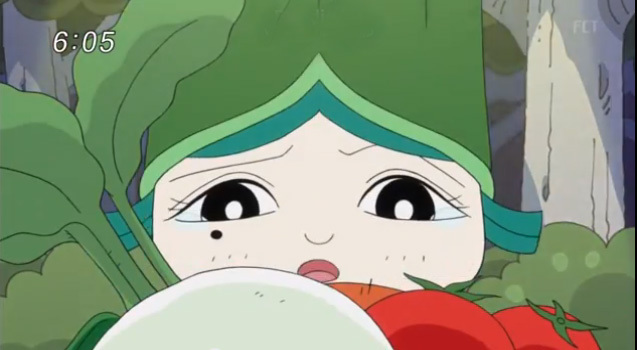 Okura-chan begins to cry and makes her sayounara speech to the vegetables. Literally this could be translated as “do not show restraint”. But 遠慮 enryo (self-restraint, self-control, self-denial) is a fundamental concept in Japanese culture. An example of enryo given to me by a friend is that she used to attend formal dinners at a restaurant where everyone had paid for a sumptuous communal meal. The meal would be on a central platter, and no one would be the first to take food. It would become cold and eventually be removed uneaten by the waitresses. No one wished to appear greedy or selfish. Everyone was practicing enryo. This may seem an extreme, but actually is a common, example of enryo. This is, of course humorous. In my experience, Japanese people view this with equal parts of humor and genuine appreciation of the sentiments.